Riot police have escorted masked contractors as they removed wood from two contentious loyalist bonfire sites in Belfast. Authorities moved in at two sites in the east of the city amid fears of fire damage to homes. The Bloomfield Walkway and Cluan Place bonfires were among hundreds across Northern Ireland due to be burned by loyalists last night as part of traditional 'Eleventh Night' celebrations to mark the 1690 victory of Protestant King William of Orange over Catholic King James II at the Battle of the Boyne. Contractors with their faces hidden removed excess wood from the Bloomfield Walkway site hours after a towering bonfire on the site was set alight prematurely. 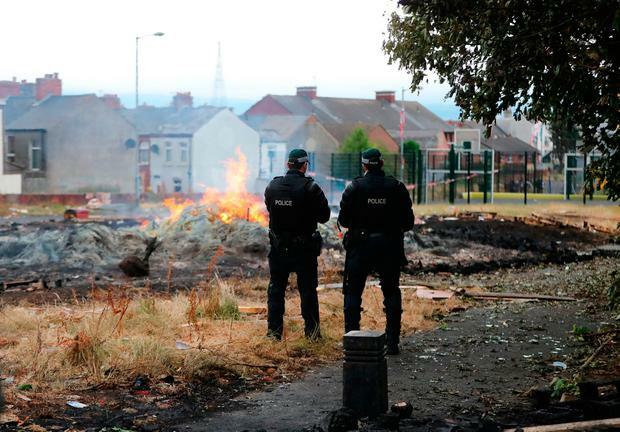 The structure was set on fire amid a tense overnight stand-off between police and loyalist youths after a High Court judge ordered that it be dramatically reduced in size. Later, workmen moved in to remove a huge bonfire built beside a main road at nearby Cluan Place. The bonfire at Bloomfield Walk has caused controversy in recent years due to its proximity to houses.